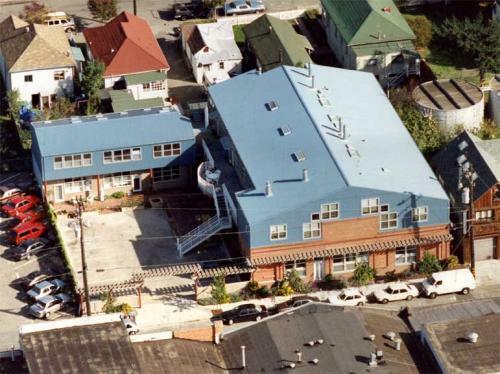 Doyle Street is a small urban cohousing community, with 12 units plus a common house. All units (condominiums) are currently owner-occupied. Units last sold at $435,000 - $560,000 about four years ago. The group formed in 1990. Project completed and first occupied in spring 1992. It was designed and (until a few years ago) occupied by architects Chuck Durrett and Katie McCamant, founders of the cohousing movement in the United States; this was the second cohousing development built in the U.S. The complex consists of two buildings. Six units and a common house are retrofitted into a brick industrial building, while three townhouse units make up an all-new building. Together they form an "L"-shape around the parking lot and courtyard, which includes a garden, children's play area, and facilities for dining outside when it's warm. A large iron gates in the courtyard can be swung out into the parking area creating a larger enclosed play or party area; this is often done on weekends. As of March 2011, no units are for sale. One two bedroom unit will be for rent in September. Please see http://www.cohousing.org/ for the most current notice of when a unit is available.